SoftPlanet makes it possible for everyone to get free Adobe Acrobat Reader DC download directly from our servers. There is no registration needed for downloading. There is only one tool for reading documents, manuals and texts in general, that we all know about, and that is Adobe Acrobat Reader DC (formerly Adobe Reader) 15.010.20056. Since its release in 1993 it has been the most preferred app in the world for reading different kinds of texts, and though its purpose is only to show the texts as they are, developer Adobe Systems Incorporated has increased its capabilities to the point where it is not only a tool for reading, but also for viewing, printing, annotating and signing of PDF files. And if that's not enough, now you can store all your texts in the Cloud and access them from any device and any location you want. 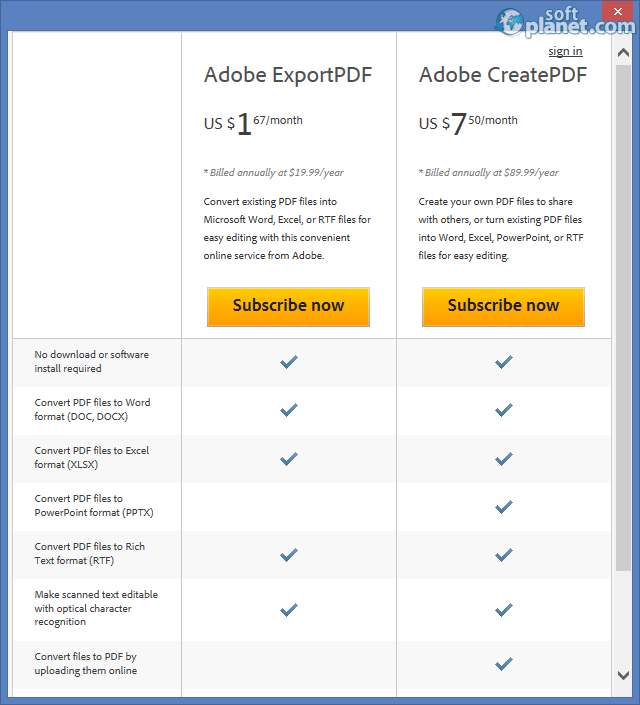 Although its main purpose, as we said, is to read PDF files, now Adobe Reader allows you to convert PDF files to Word, Excel or RTF files and also create PDF files from such files, but you should have in mind that these options are paid, and the subscription costs USD 1.67 per month with Adobe ExportPDF, while the Adobe CreatePDF want USD 7.50. But don't worry, we have free tools to download from SoftPlanet which can help you, like for example, PDF to JPG, Free PDF to Word Converter, PDF Document Writer, Nitro PDF Reader and also PDF Splitter. With all this tools you can make one great reading and editing machine of yours that will have a lot of capabilities. 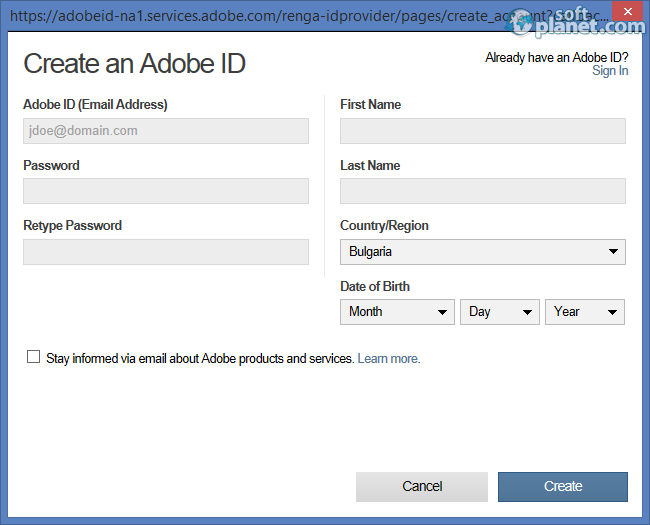 But Adobe Acrobat Reader DC by itself offers a nice set of options, like adding comments in the text you are reading, signing of your PDF files, and the mentioned Cloud upload, although it wants an Adobe ID, which can be created very easily. But you can also highlight important parts of the texts, and toggle between touch and highlight modes. Adobe Acrobat Reader DC comes with its familiar look, but it appears that some smoothness to the vision was added in the 11th version and it looks more like a Windows 8 application. When you start the program, it opens the familiar main screen, which first offers you to open a Recent File, or another one from a browser. Here the Convert PDF to Word or Excel and Create PDF buttons, share file, sign document and also store your files online are also added. After you open a PDF file you can change the view as you can rotate it, or zoom. Also there are the familiar navigate page buttons, as there are the usual shortcuts, and all of it is situated in the right place. Adobe Systems Incorporated didn't make the mistake of changing a lot of the interface of the well-known Adobe Acrobat Reader DC, as Microsoft did with Windows 8. 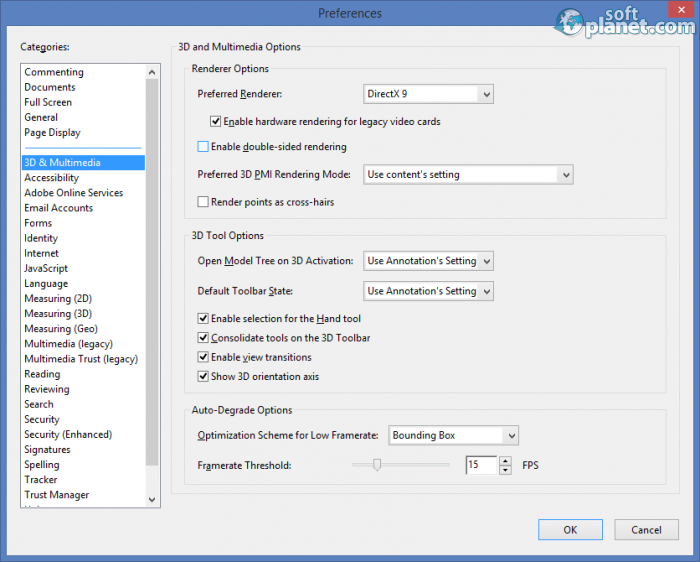 In this way you have the similar look, but with added functions in the newest version, which helps you to work with the app in the best way possible, but not always the way you like it, as you can't personalize Adobe Acrobat Reader DC to your liking, but that is a problem with all the versions of the program. Adobe Acrobat Reader DC has a lot of functions, that can make the reading of a PDF file a pleasure and in this way you can at least personalize that. And there are a lot of functions that allow you to do it, as full screen and read mode, different zooming levels, many ways to fit the text, different page display modes, show and hide different toolbars, and the best function is the Read Out Loud, which can read your texts that you want to hear, while in the mean time you are doing other jobs. The use of this function is limitless, as you can play yourself a book while working, listen to a newspaper, a magazine or files that you need to read in your work, while actually doing something else. At first the Read Out Loud function crashed on the testing machine, but on the second attempt all started smoothly, but keep in mind that if you minimize the app the Read Out Loud stops. Anyway, the quality of reading was surprising which made the Adobe Reader even more helpful, but for now the function is only in English. But still, the usefulness for blind people is even more amazing. 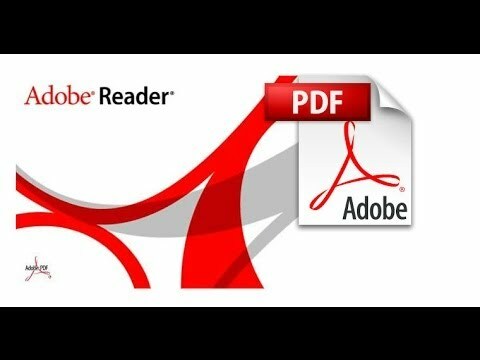 We all know that this is the best app for reading PDF files, but if you delve a bit more in Adobe Acrobat Reader DC 15.010.20056 you'll find out that it has even more functions than you have imagined. We were surprised by the quality of the Read Out Loud function, which makes the app even more amazing than usual, and the Cloud upload lifts its usefulness to an even higher standard. That's why we recommend the program to every user, as it should be a part of every computer software suite, not only because it is the main tool for reading PDF files, but also because of its capabilities and great additional functions. Adobe Acrobat Reader DC is VIRUS-FREE! 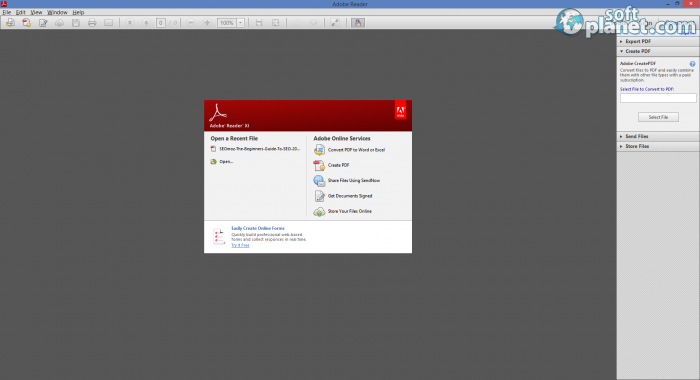 Our security scan shows that Adobe Acrobat Reader DC is clean from viruses. The current version of Adobe Acrobat Reader DC has been scanned by our system, which contains 46 different anti-virus algorithms. That ensures that Adobe Acrobat Reader DC 15.010.20056 is 100% safe for your computer.